You are here: Home / Collections and Curiosities / Hidden Histories / The "Skating Pond"
Vassar’s campus consists of over 1,000 acres, but most of us identify with a small number of selected features. From the expansive quads and manicured playing fields to the Shakespeare Garden, Noyes Circle, and the man-made Sunset Lake, Vassar’s varied, carefully maintained landscape contributes to the feel of the main campus. These landmarks attract prospective students, and once they matriculate, students frequent these spots, the names of which become a part of their Vassar vernacular. However, if you were to mention the Skating Pond, few people would probably know what you were talking about. Nestled at the northeastern edge of campus between Thelberg Road, the back of Kenyon Hall and the former Archery Range, the Skating Pond is outside many students’ normal range. The most common passersby might be service trucks that enter through the inconspicuous back gate from Manchester Road and Route 55. Its location also places the Skating Pond beyond Buildings and Grounds’ usual landscape maintenance. This explains its wild aesthetic, at least when compared to other areas of campus. The pond is small and shallow and surrounded on three sides by a woody boundary that keeps it largely hidden from those walking nearby. Layers of fallen leaves collect in its waters, and sparse grass grows on its sometimes roughly defined bank. Dismembered logs protrude from the water’s surface, and although two wooden benches sit near the water’s edge and a stop on the fitness trail is nearby, few people go to the Skating Pond, and despite what the name may imply, it is never used for skating. MacCracken saw numerous possibilities for the property: developing a back-road for coal and other deliveries; perhaps adding a railroad spur to reduce costs; developing pasturage and barns for presently crowded livestock; building a small golf course on the least productive field; using some of the acreage for athletic fields and facilities; or adding “a very beautiful sheet of water” to the scenic attractions. He wrote an emergency letter to his executive committee, breaking the rule that requests to the committee should not be made during the period between meetings. The acquisition, he said, would “greatly enhance the value of the campus,” and would provide needed protection. “With the present rapid growth of Poughkeepsie and the building in the direction of Arlington, which is very fast just now, it is doubtful whether the opportunity will again come for us to secure the property.” Purchasing the Wing Farm would expand the eastern section of campus by 117 acres at a total cost of $40,000, and the college was confident that between donations from parents, trustees and others, it would be able to raise the necessary amount. The trustees secured the needed funds, and on July 1, 1923, Vassar took possession of the land and “all standing crops.” The agreement permitted Mr. Wing and his sister to continue in residence on a five-acre rectangular plot, located on land adjacent to what is now the golf course. In April, while negotiations for purchasing the property had still been going on, Louis P. Gillespie, Vassar’s general manager and purchasing agent, had suggested the idea for a pond in a letter to President MacCracken. Gillespie proposed building a dam across the Casperkill where current college property met the Wing Farm—presumably at about the point where it crosses Thelberg Road—which he hypothesized would create a body of water even larger than Sunset Lake. The following day President MacCracken, responding to Gillespie’s proposal, wrote to longtime trustee Ray Morris. He suggested flooding the low-lying land by the brook (which we may again assume to be the Casperkill), thereby forming an attractive eastern border to campus. The idea became part of the transfer agreement between Mr. Wing and the college, which gave the college the right to flood the land if it saw fit. 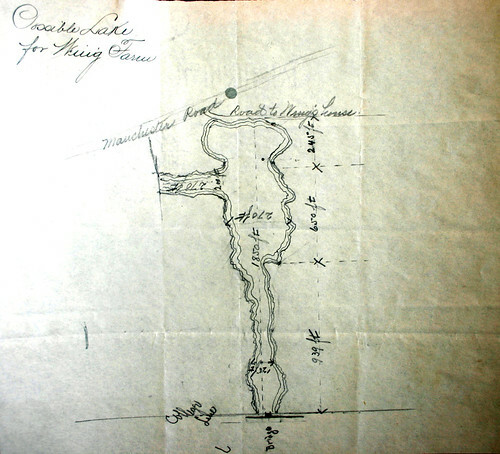 The idea for a lake was not acted upon until two years later, when Mr. M. Sugar from the office of the superintendent of buildings sketched a rough diagram of a possible lake for the site. His proposed lake was 1,850 feet long north to south and 270 feet at the widest point, and it would drain into the Casperkill Creek. Sugar estimated that a ten-foot dam would flood eight to nine acres of land, and his sketch proposed a lake that spanned from the present-day Skating Pond through the length of the former Archery Field. The land was indeed flooded, but only to about a fifth of the size of Sugar’s intended size. Subsequently, the college constructed the golf course, Blodgett Hall, Palmer House, faculty housing, and the Wimpfheimer Nursery School, and Kenyon Hall on the Wing Farm property. Kenyon Hall, built in1930, answered what MacCracken had called the “greatest single need of the college,” a complete and up to date gymnasium. The plans for this new building included a path to outdoor sports areas, an important aspect of the students’ physical education. In addition to the golf course and sports fields, one of these areas appears to have been the Skating Pond, which might have been used for recreational ice hockey. A pair twins, Joslyn and Sally Magowan ’37, both of whom would be associated with professional figure skating, presumably used the pond for practice during their student days. However within about a decade, the site fell into disuse, and it remained neglected for the next fifty years. The Skating Pond did not attract much attention until the 1990’s, when it became a minor element in President Frances Daly Fergusson’s grand revitalization of Vassar’s buildings and grounds, which included significant landscape restoration and reclamation on the Skinner boardwalk and the Vassar Lake trail. Former Buildings and Grounds director Jeff Horst and his four-person crew spent two full weeks thinning out massive amounts of invasive bush honeysuckle and purple loosestrife that had come to dominate the abandoned pond. In the process of clearing out the overgrown site, they even discovered a Castro Convertible sofa. After Horst and his crew thinned the invasive species and replaced the dam, they returned the site to its original name and purpose, as a skating pond. They developed a system in which a red flag was flown over the pond if the shallow water was not fully frozen, signifying that it was not safe for skating. If a green flag flew, the pond was open to students, faculty and the public for recreational skating and social gatherings. But despite efforts to publicize this amenity around campus, few Vassar students used the Skating Pond. Its prime audience was faculty families. Without much popular interest and steady attendance, the Skating Pond was maintained as a site for skating for no more than a couple of seasons, at which point it once again fell back into a state of relative disuse. The story of the Skating Pond evokes a pleasant sense of natural rebellion that sets it apart from other areas on campus. The area’s obscurity, its geographic isolation and its gentle refusal to become a campus utility help give it its charm. Elizabeth Adams Daniels, “Vassar in Beauty Dwelling: The Legacies of Frances Daly Fergusson, President of Vassar College 1986-2006,” Vassar College Libraries, Archives and Special Collections homepage, http://specialcollections.vassar.edu/exhibits/fergusson_years/essay1.html (accessed 5/5/09). E-mail interview with Elizabeth Daniels, Vassar College Historian, Feb. 17, 2009. E-mail interviews with Jeff Horst, Vassar College Buildings and Grounds, Feb. 13, 2009 and April 8, 2009.